Marylla - leather goods manufacturing & commercial LTD.
For us, quality is our defining aim and consider it to be the outmost means to keep and extend the market. With this in mind we operate our company in a way that our name means guarantee for our customers. Our company was founded in 1968 by Horizont ÁFÉSZ which was later operated in Marcali as a factory of Palota Bőrdíszműgyár (Palace Fancy Leather Goods Factory) in Budapest. As a result of a local initiative the company became independent in 1992. Following the privatization the majority of the proprietorship got in the hands of the workers in two years’ time with an accumulated tradition worth being mentioned. The company changed its name to Marylla Leather Goods Manufacturing & Commercial LTD. At present it employs 145 workers being one of the major light industries in the town. The company produces seat and interior covers for vehicles and for export some traditional fancy leather goods (such as women’s bags and luggage interior parts) in a high standard quality as well. Since 2003 we have been operating the ISO 9001:2015 quality system. We give a high priority to develop quality awareness, provide further trainings and teach and apply new technologies for our workers. The Marylla LTD. has all the tailoring-, preparatory- and sewingmachines needed for the production process of syntethic and leather goods. The company's warehouse ability can ensure that the stuffs & substances incoming by different customers or obtained, as well as the finished goods and products will be stored properly separated. We are carryig out services, manufacturing our products with regard at the demands of customers. The leadership handles quality assurance as a determining factor in gaining customers, retaining and widening our market. That's why we are running the enterprise in order to signify warranty for customers. The enterprise developes quality management according to international standard EN ISO 9001:2015. Our quality management is looking forward to take in consideration quality influencing factors, improving quality at any time. We are examining, controlling and assessing our quality assurance system regularly and taking the necessary measures to enhance our efficiency. The most important task for our employees is getting acquainted with the quality assurance system in order to be able to cooperate constructively and continuously. We are considering as an important task to improve our employee's quality- consciousness with regular trainings. 8700 Marcali, Marczali Henrik u. 9. Marylla Leather Goods Manufacturing & Commercial LTD.
2017 // All rights reserved. 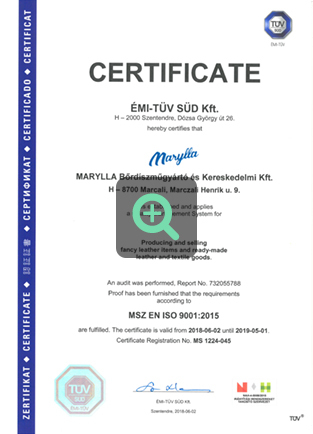 Company seat: 8700 Marcali, Marczali Henrik u. 9. Company park: 8700 Marcali, Marczali Henrik u. 9.